CLEAR LAKE, S.D. – Ytsje Andringa was named the 64th South Dakota Dairy Princess in a ceremony that was held on the evening of March 26 at the Denny Sanford Premier Center in Sioux Falls, S.D. The ceremony took place during the welcome banquet for the Central Plains Dairy Expo. Kendra Schweer, 18, was named runner-up. Schweer, the daughter of Richard and Michelle Schweer, will be graduating from Milbank High School this spring. She plans to attend Lake Area Technical Institute in Watertown, S.D., where she will study agriculture precision technology. Andringa, 18, is the daughter of Sietse and Aafke Andringa. She is a senior at Great Plains Lutheran High School in Watertown and will be attending Lake Area Technical Institute this fall, where she plans to major in nursing. Andringa was awarded a $1,000 scholarship from Midwest Dairy Association’s South Dakota Division, which sponsors the dairy princess program. Schweer received a $500 scholarship from Central Plains Dairy Expo. Andringa was born in Alberta, Canada, where her parents operated a 90-cow dairy farm. The Andringa family moved to Clear Lake, S.D., in 2003 and built a 350-cow dairy facility. Their dairy operation has grown to its present size of 1,800 head. In 2016, the Andringas began to install milking robots on their dairy. Their goal is to milk their entire herd with robots. Andringa said her family is proud of her achievement. Andringa is the secretary of the Watertown FFA chapter. She has participated in FFA public speaking events and in dairy cattle judging. She has also shown dairy cattle, including at the South Dakota State Fair. In addition to all of these responsibilities, Andringa is also employed as a Certified Nursing Assistant at a local nursing home. She also does some relief milking at the Troy Stimson dairy farm, an 80-cow operation located south of Watertown. Because of her hectic schedule, Andringa did not have time to try on her formal dress until the morning of the contest. Andringa is cognizant of the tough times many dairy farmers have been enduring. One of Andringa’s top goals as dairy princess it to educate young people about the dairy industry and the wholesomeness of dairy products. 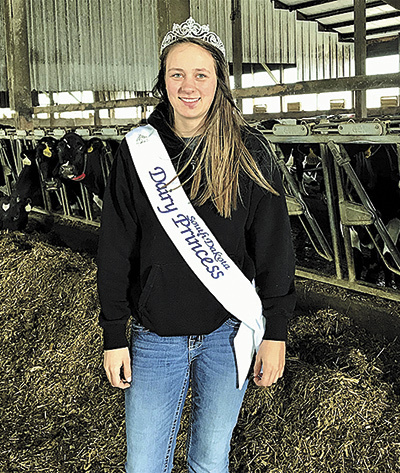 Over the past several years, Andringa has been encouraged by others to participate in the South Dakota Dairy Princess program. Andringa is looking forward to her coming year as South Dakota Dairy Princess. And, after her year serving as ambassador for South Dakota’s dairy industry is over?